The Sierra Club Marin Group is working on an ordinance restricting single use plastic foodware for all our Marin cities and the country. You can help make a difference in reducing plastic waste in Mill Valley. MVCAN Eco Team is asking people to show up and support a request for Mill Valley to adopt an ordinance restricting single use plastic foodware. Similar plastic waste reducing ordinances have recently passed in San Anselmo, Berkeley, Alameda and other cities around the country. Let’s make Mill Valley next! 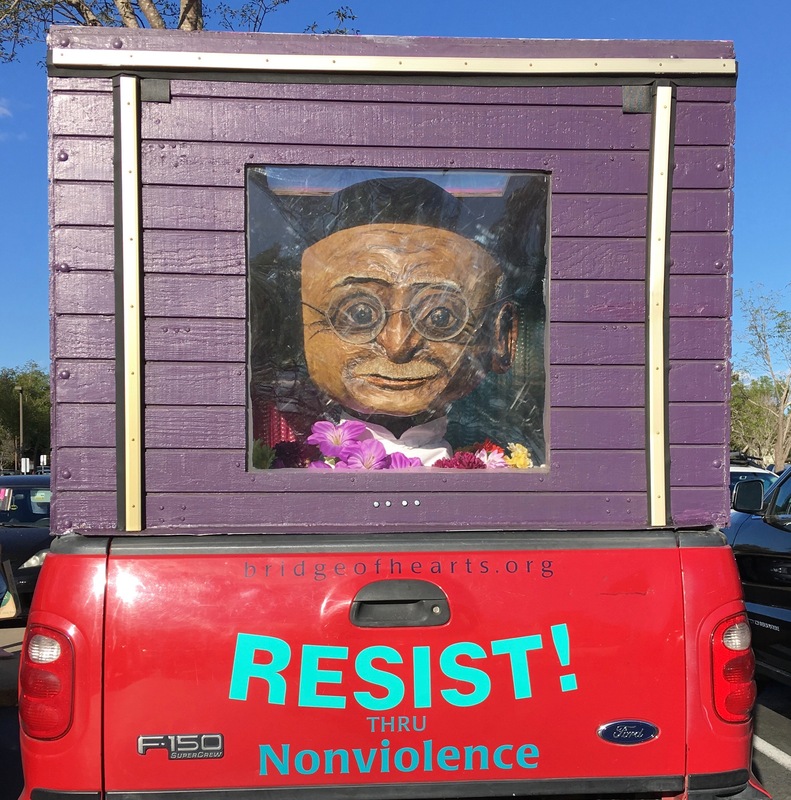 On Monday, March 18 MVCAN Eco Warriors team needs people to show up at Mill Valley City Hall, to show support during the Council’s Open Time session (at the beginning of their meeting). Also, sending an email to our Mill Valley Council members to show your support of the Ordinance would be most helpful. If you can attend, email Marilyn Price: mprice@the-acorn.com so we can coordinate our presentation. Also, feel free to just show up at 6:15pm. 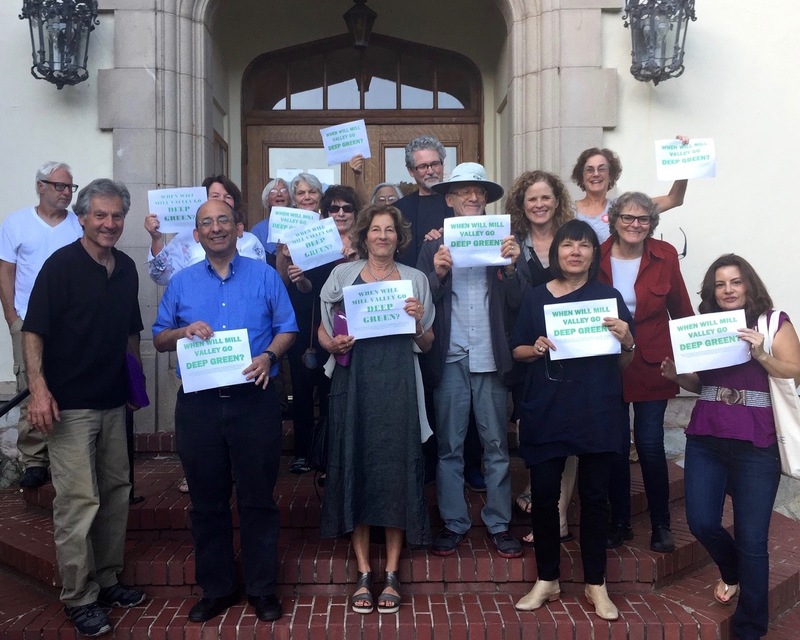 MVCAN Eco Team at Mill Valley City Hall in 2017. 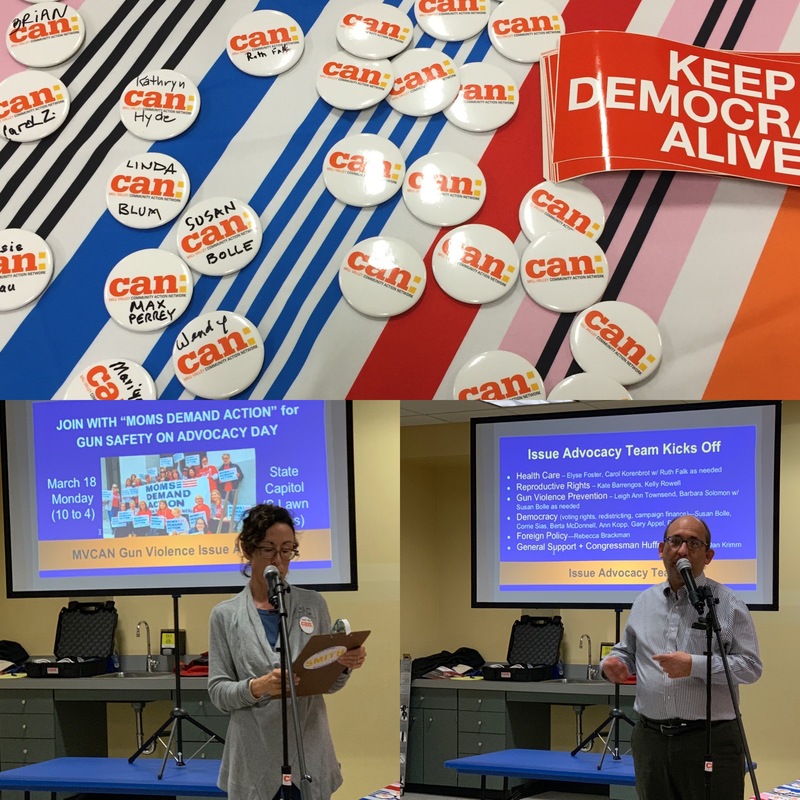 MVCAN members are invited to join with the Marin Chapter of Moms Demand Action as they meet in Sacramento for 2019 Advocacy Day for gun safety. They will be hosting trainings and then attending meetings to speak with State Legislators about the bills they are supporting, including increased funding from the California Violence Intervention and Prevention Program (CalVIP). Please join in and support the hundreds of Moms Demand Action members who will be attending from all over California. The event will start at 10 AM on the steps of the South Lawn with speakers. Then groups will visit individual senators’ offices. You will be assigned a group if you RSVP. Carpools are being organized to take people from Marin to Sacramento. We will be meeting at Paxti’s Pizza in the parking lot at the Bon Air Center, Greenbrae, leaving at 7:45 AM. For more information please contact Helen Rosen, Moms Demand Action leader, at hnrosen1@yahoo.com. 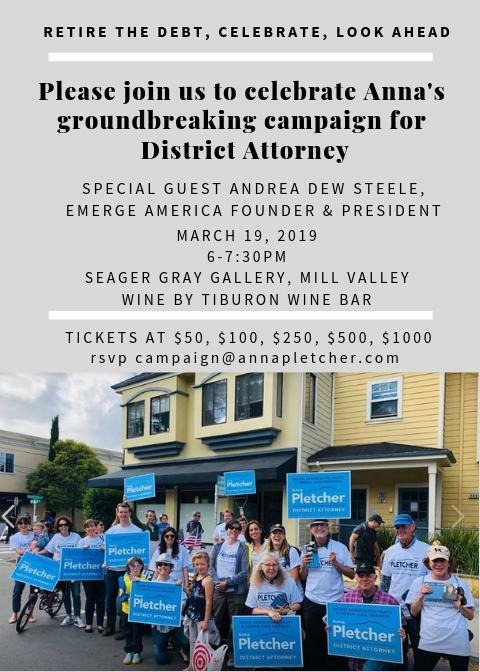 Join MVCAN and community members in celebrating Anna Pletcher’s DA campaign. Although Anna did not win (losing by only the slimmest of margins), our political activism has markedly increased the visibility of the DA office and the critical issues that the DA directly affects in the areas of immigration, restorative justice, and youth imprisonment. These efforts to affect change in Marin are ongoing. Many thanks to Peter Graumann and his large team for their tireless work on Anna’s campaign and beyond! Timing - How to strategically use timing. Sun. March 31 - 3:00 to 5:00 p.m.
Join us Sunday, April 7, for a special environmental-themed program at our MVCAN Monthly meeting. 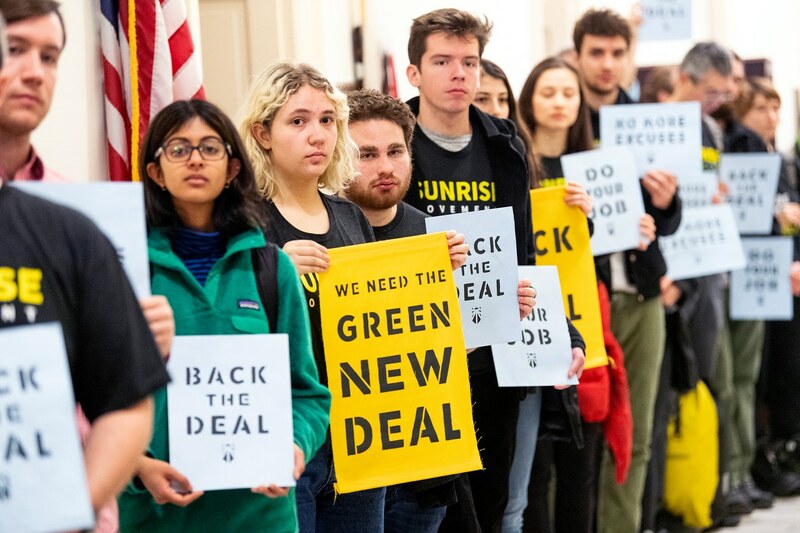 Young activists from the Sunrise movement will speak about their activism and the latest on the Environmental movement. 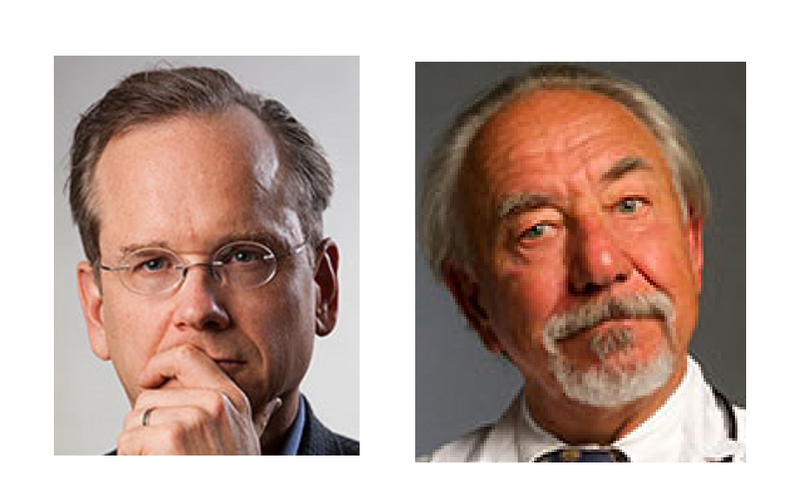 In addition our local Eco expert Max Perrey, former head of Sierra Club Marin, will speak on California’s fight to limit carbon emissions. MVCAN members will get a special insider discount on tickets, because we are a partner organization for the event, With our VIP discount, it is only $23.50 (plus ticket fees). At our recent meeting, MVCAN hosted the lead organizer of PLAN Nevada, a major recipient of our Airlift fund for grassroots groups. For more info, see Airlift.fund. 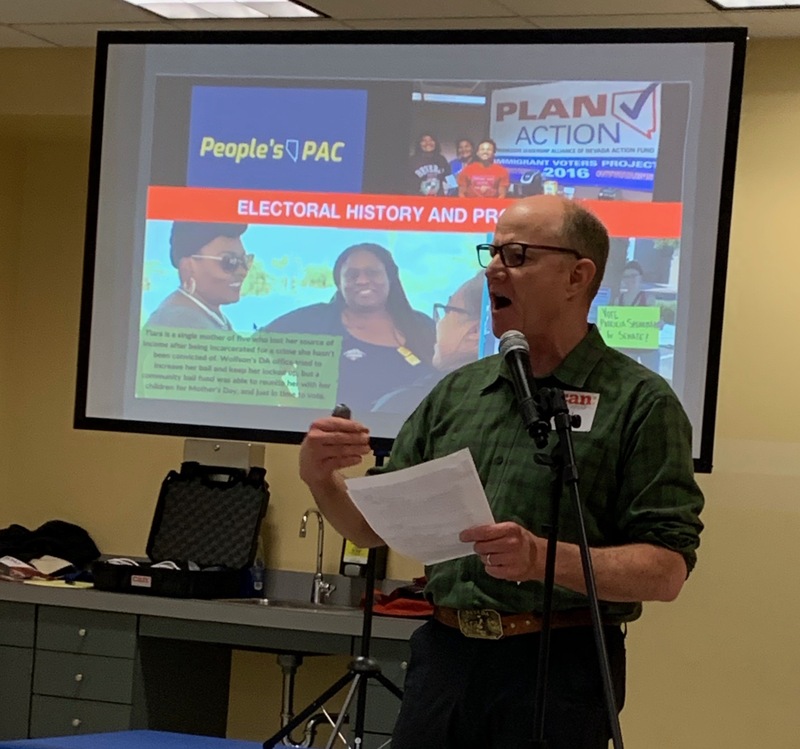 Bob Fulkerson gave a riveting account of all the years of complex organizing that has ultimately resulted in a virtual total swing from red to blue in Nevada. As well we heard from several MVCAN advocacy activists reporting about current legislation. 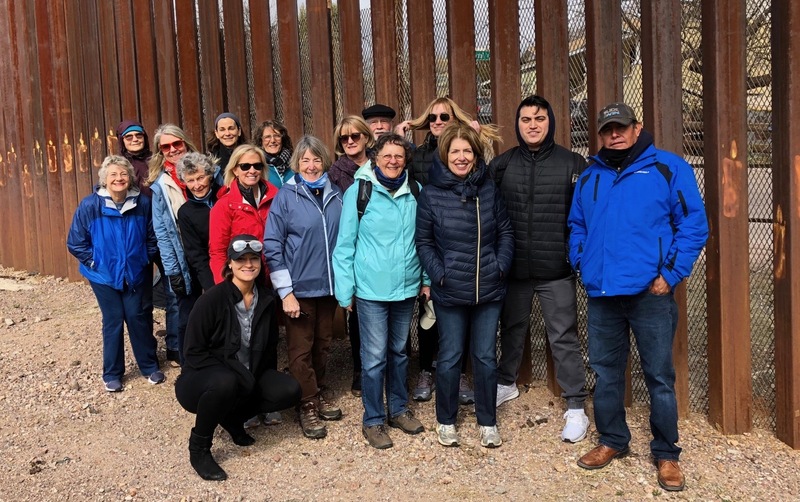 Marin delegation team in front of fence/wall in Nogales, Sonora, Mexico. 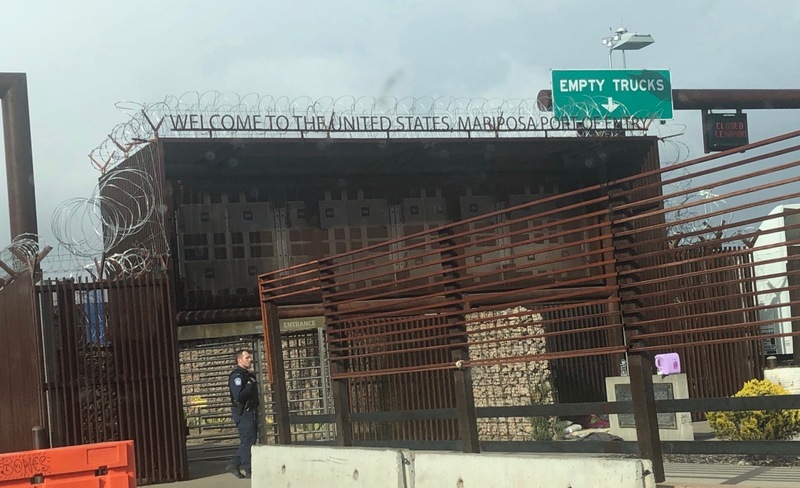 Returning to the US on the Mexico side - The sign (at the top of the building) says "Welcome to the United State, Mariposa Port of Entry." Note that it is covered with concertina (barbed) wire! What a welcome! 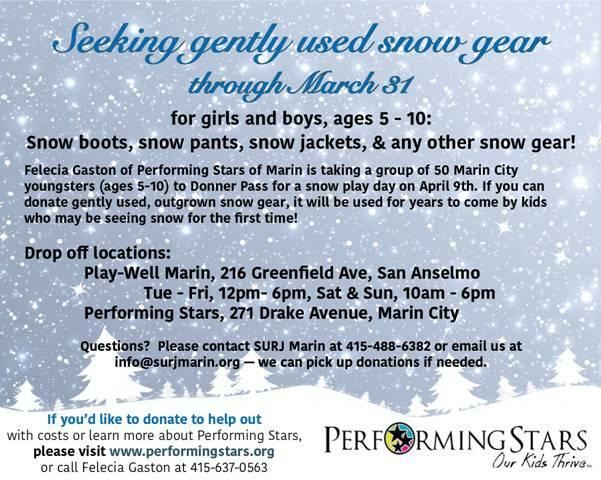 Help Marin City kids enjoy the snow! Note that donated clothing can be picked up at your home. Contact SURJ at 415-488-6382.